Dental Hypnosis | What Could It Do For You? Dental hypnosis is great! I think it is under-estimated and under-used. This partly because it is mis-understood, and I find that hypnosis in general does not have a wonderful public reputation, exactly because of that mis-understanding. Let me tell you how hypnosis for dental treatment works. A little background; As a child, I was terrified of visiting the dentist. And I thought I was the only one, because nobody else talked about it much, least of all my parents. But when I was a teenager, I discovered that my mother had a dental phobia, and she didn't want to talk about it in front of me incase she made me even more frightened than I already was! BUT here's the hammer - she had gotten some hypnosis a few years before to help her with dentistry, and she could then go along and use self-hypnosis to get herself comfortable before each dental visit! And she never thought to tell ME about this! I remembered this when I graduated from dental school, and signed up for dental hypnosis courses to learn how to help my own patients. And what I saw and learned on those courses was astounding. I was amazed at how powerful hypnosis could be for some people. And I was hypnotised myself. IF you would like to read more about how you can download hypnosis files and listen to them in the privacy and comfort of your own home, at your own pace, follow this link to Hypnosis downloads explained. You can read all about how this self-hypnosis program works, and go from there to the download site if you wish afterwards. After completing the courses, I turned up for work at my office bursting with enthusiasm and a desire to show people how great dental hypnosis could be. But my balloon was popped when I came up against patient after patient who claimed to be frightened or terrified or even phobic of dental treatment, but they didn't want anything to do with hypnosis! I was stunned. At first, I consoled myself with the thoughts that my office environment and painless shots were enough for these people to tolerate dental treatment. 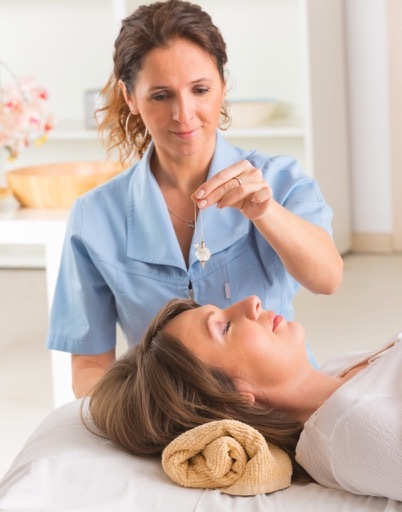 But I kept wondering why there was so much resistance to dental hypnosis, and after quite some time and a lot of investigation, I found my answer. FOR A LOT OF PEOPLE, HYPNOSIS HAS A BIT OF AN ODD REPUTATION. For most people, their only knowledge or experience of hypnosis is from television shows or maybe live shows at a theater. While these shows might be entertaining and amusing, I think they damage the reputation of hypnosis. What you have seen is this guy up on stage apparently controlling a few people who have stepped up from the audience. He makes them crow like chickens, makes them think they are swimming, or that they are being attacked by birds. We can laugh at their antics on stage. BUT THIS SORT OF HYPNOSIS HAS ALMOST NOTHING TO DO WITH DENTAL HYPNOSIS. First of all, YOU DO NOT FALL ASLEEP. AT NO TIME. The sensation you have is that there is a person talking to you, making suggestions that you are calm and relaxed, and that you might like to rest your eyes. After a few minutes, you do indeed close your eyes. BUT YOU ARE NOT ASLEEP. As the person continues to chat away to you, they might suggest that you count down from 300 in your mind. Of course, at some point you lose track, and your mind starts to wander. Then you remember that you are supposed to be being hypnotised, and you feel a little guilty that you have not been paying attention. You listen more closely to the person talking, and they are still going on about being relaxed. Your mind wanders again, and you are waiting to fall asleep. Then the person might ask you to open your eyes, and you do so, again feeling a little guilty that you are not "asleep" yet. Then they ask you if you can lift your left arm. To your surprise, you find that it feels so comfortable and heavy, you can't move it! BUT the sensation is a little odd - you know that, if someone were to burst into the room with a knife, you could instantly jump up and defend yourself. But for now, your arm is comfortable where it is, and it won't move!! Once again, you may feel a little guilty that you are not "asleep", but at the same time you wonder how the person has suggested that your arm stay put. All these thoughts are going through your head, and you are wondering if the hypnosis is not working because you are still awake! The the person suggests that you allow your eyes to close again for a few minutes, and they start chatting away again as you puzzle over what's going on. The next thing you know is that are counting down from FIVE and you are opening your eyes, and your arm is normal again. You start to protest that you never went to sleep, and that the hypnosis didn't work. But then you remember your arm. You just relaxed enough that the person could make some suggestions to you, that you then accepted. In a nutshell, that's hypnosis. You never really "fall asleep". You always feel like you're sitting there all comfortable, while this guy drones on about relaxing. BUT at some point he will make some suggestions about, for example, feeling comfortable with the idea of visiting a dental office. He may even take you through a mental journey to the dental office, suggesting at each point of the way that you are relaxed and happy to be there. Here's the clever bit; he will then (usually) suggest that this journey was real, but that you don't need to remember it. Your UNCONSCIOUS mind will remember it for you. And so afterwards you don't remember the "mental journey" to the dental office. All you know is, you didn't "fall asleep" and you can't recall the guy talking about dentistry at all. It seems a little weird, but that's how it works!! IMPORTANT POINT; for anyone concerned about a hypnotist making improper suggestions, there's no need to worry. This whole process is about making SUGGESTIONS that are ACCEPTABLE to you. If he asked you to take off all your clothes, you would find that improper or unacceptable, and you would just open your eyes and refuse! Remember, AT NO POINT ARE YOU ASLEEP! You always know what's going on, and only accept suggestions that are reasonable. SO, where do you go to get some hypnosis? For most people, you can do this at home using self-hypnosis downloads. All you have to do is find a suitable hypnosis website with download resources, get the download, and then go somewhere quiet for 20 minutes and listen to it. SIMPLE! If you want the DENTAL PHOBIA hypnosis download, go to Hypnosis Downloads - Dental Phobia. The company is run by qualified and experienced hypnotherapists, and I have used some of their products myself. My top recommendation for dental hypnosis!